While it is well known that evolution is the core concept of biology, it can often be challenging to provide examples that can easily be used in the classroom of how humans have adapted to their environments. While the fossil record, and physiological evidence demonstrate that this has occurred, what is needed is an example of how this has occurred in the relatively recent history of humans. One such study of populations living in the high-elevation mountains of Tibet demonstrates how the processes of evolution and adaptation influence humans. 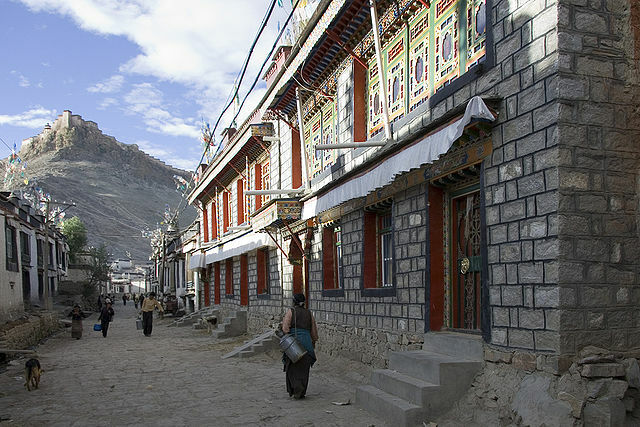 Many elevations in Tibet are above 13,000 feet. Normally, if a person moves to a higher altitude, his or her body responds by making more hemoglobin, the component of blood that carries oxygen, which thickens the blood. For minor elevation changes, this does not present much of a problem. But for people that live at extreme elevations (some people in the Himalayas can live at elevations of over 13,000 ft, or close to 4,000 m), this can present a number of health problems, including chronic mountain sickness, a disease that affects people who live at high altitudes for extended periods of time. study. Researchers have identified an allele of a gene that reduces hemoglobin production at high elevations. Comparisons between Tibetans at both high and low elevations strongly suggest that selection has played a role in the prevalence of the high-elevation allele. The gene is EPSA1, located on chromosome 2 of humans. EPSA1 produces a transcription factor, which basically regulates which genes are turned on and off in the body, a process called gene expression. The transcription factor produced by EPSA1 has a number of functions in the body. For example, in addition to controlling the amount of hemoglobin in the blood, this transcription factor also regulates other genes that direct how the body uses oxygen. When the researchers examined the variations in EPSA1 in the Tibetan population, they discovered that their version greatly reduces the production of hemoglobin. Therefore, the Tibetan population has lower hemoglobin levels than people living at lower altitudes, allowing these individuals to escape the consequences of thick blood. How long did it take for the original population to adapt to living at higher elevations? Initially, the comparison of variations in these genes between high-elevation and low-elevation Tibetan populations, suggested that the event may have occurred over a 3,000 years period. But researchers were skeptical of that data since it represented a relatively rapid rate of evolutionary change. Additional studies of genetic databases yielded an interested finding – the EPSA1 gene in Tibetans was identical to a similar gene found in an ancient group of humans called the Denisovans. We still do not know a lot about the Denisovans, but genetic analysis of the DNA samples that we have from bone fragments suggests that they interacted with early human populations, including Neanderthals and the early Tibetans (among others) Scientists now believe that the EPSA1 gene entered the Tibetan population around 40,000 years ago, either by interbreeding between early Tibetans and Denisovans, or one of the immediate ancestors of this lost group of early humans. The Denisovans are gone, but their genes are allowing Tibetans to adapt and survive at very high elevations. A version of this article appears in Michael Windelspecht’s Inquiry into Life and Human Biology texts.